Perennials (or annuals), 50-120 cm (usually glabrous, sometimes sparsely pubescent distally on peduncles). Stems erect. Leaves sessile; blades usually linear or lanceolate, rarely subelliptic, 50-140 × 4-17 mm, bases ± connate, margins entire, minutely serrate, or spinulose-serrate. Heads 20-100+, in dense, scorpioid-cymiform arrays. Calyculi of 1-3 linear-lanceolate bractlets 4-6 mm (often surpassing involucres). Involucres suburceolate, oblong-angular, 3.6-4.5 mm. Phyllaries 5-6(-9), oblong or ovate-orbiculate. Ray florets 0 or 1; laminae yellow, ovate-spatulate, 2-2.8 × 1.5-2 mm. Disc florets 9-14; corolla tubes 0.8-1 mm, throats funnelform, 1.3-1.5 mm. 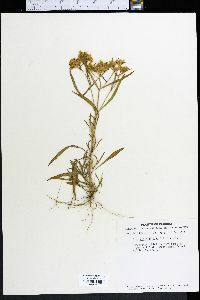 Cypselae oblong-oblanceolate or linear, 1.2-1.8 mm; pappi 0. 2n = 36. Flowering year round. Saline sand areas, beaches, brackish marshes, pinewoods; 0-10 m; Fla. Flaveria floridana is known only from the lower Gulf coast of Florida; it is especially prevalent in the Tampa Bay area. The relatively long calyculus bractlets and modified peduncular leaves that extend beyond the heads distinguish it from F. linearis, the other perennial species in Florida. The closest relative of F. floridana is probably the similar F. brownii of the Texas Gulf coast.